Designed for ease of operation and superior merchandising, hog dog rotisseries broil your hot dogs to tasty perfection. 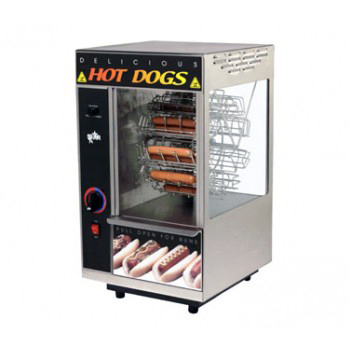 Hot Dog Broilers are equipped with a built-in heated bun drawer and feature either a cradle or spike type wheel. The cradle wheel provides a basting motion that delivers an evenly cooked hot dog with a consistent color. Spike wheels spear the food product and rotate while cooking. Whichever model you choose, our selection of hot dog rotisseries offers a low-maintenance way to attract more customers and increase your impulse sales.